Rod King is interviewed by the Middle Way Society on the formation, development and aims of the 20's Plenty for Us movement. Westminster Road Danger-2015 from Rod King on Vimeo. The Borough of Westminster has the highest levels of pedestrian and cyclist casualties across the whole of London. Whilst most inner London Boroughs and many of our iconic cities have adopted wide-area 20mph limits, Westminster persists with speed limits that are 50% higher. For our "Time for 20" conference on 18th Feb 2014 we arranged to video a Q & A Session with Transport Minister, Robert Goodwill. Change road speeds without humps by petitioning the European Commission for 20mph (30kph) as the normal speed limit where people live. 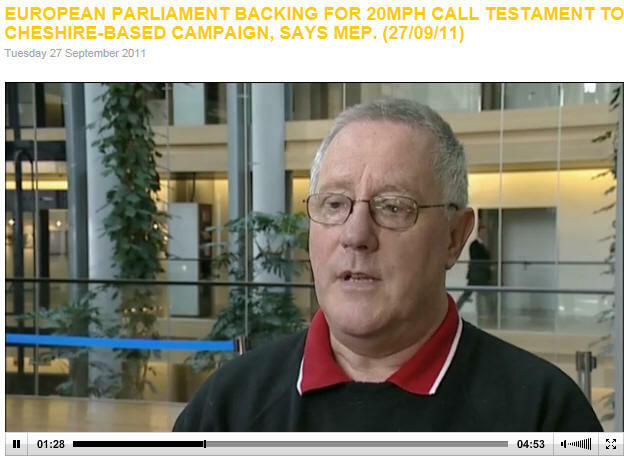 In 2011 we were invited to Brussels to talk to MEPs and EU officials about the success of our campaign in the UK. This was especially relevent because the EU Transport and Tourism Committee were developing their report on Road safety in the EU. "MEPs call for a 30km/h speed limit in all residential areas and on single-lane roads without cycle tracks, to help cut the number of children under 14 years old killed on roads by 60% and those seriously injured by 40%. They also say children should be taught road safety at the youngest possible age." This set of videos gives an idea of our involvement. You can download our briefing sheet on the issue here. 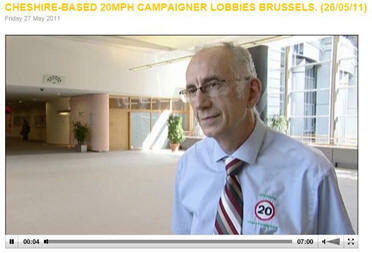 What the chair of the Transport and Tourism Committee of the EU said about the 20's Plenty for Us campaign. 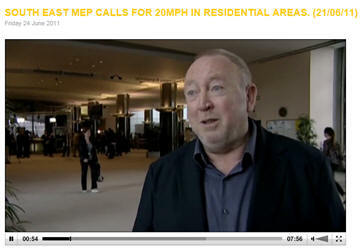 MEP Keith Taylor who introduced the EU amendment to strongly recommend 30kph (20mph) speed limits for all residential roads. Being interviewed after speaking to MEPs on the Transport and Tourism Committee. This video was made in the EU parliament building. Brian Simpson MEP is the chair of the Transport and Tourism Committee. 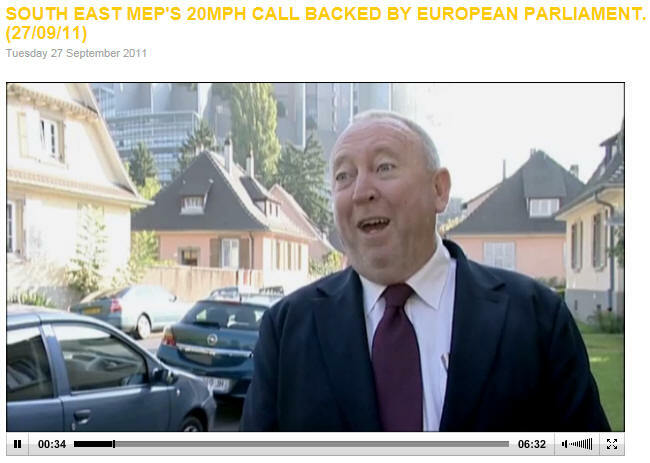 hear what he had to say about 20mph limits. 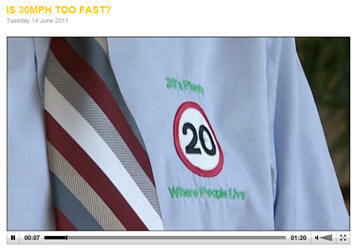 Short video made on the case for 20mph limits in Europe. 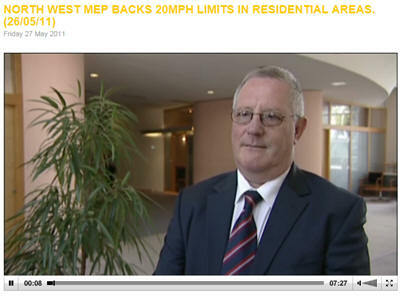 Keith Taylor MEP for South East England on how the Transport and Tourism Committee has subsequently recommended 20mph limits for residential areas. What ONE change would have the biggest positive impact on society? In his response to the What One Change question, Danny Dorling calls for a default speed limit of 20mph in residential areas. More than a successful campaign to save lives, Danny explains why the "20's Plenty" campaign also offers a route to wider social change. Last year we were approached by the StreetFilms who work on sustainable transport initiatives across the world. They had heard of our campaign and created this video. New Yorkers have been looking at the progress in the UK on 20mph limits and will shortly be introducing a wide area 20mph limit in the Bronx. 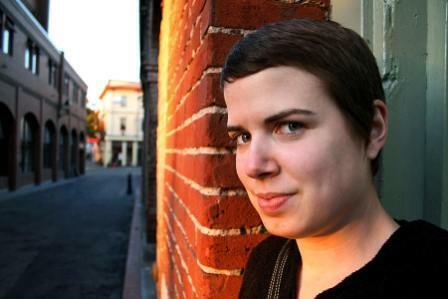 In November 2010 we were invited by Transportation alternatives to speak at their "Stop Speeding Summit" conference. This is a video made by StreetFilms of a walkabout with Senator adams.